Harper & Row, 1974. Book. Very Good. Soft cover. Paperback in very good plus condition. 8th edition. Pitman Publishing, 1980. Book. Good. Soft cover. Trade paperback in good plus condition. Faber & Faber, 1987. Book. Very Good. Soft cover. Trade paperback in very good plus condition. HarperCollins Distribution Services, 1973. Book. Very Good. Hardcover. Hardback in very good condition with a very good dust jacket. writing first blank page otherwise clean. Random House Inc (T), 1974. Book. Good. Hardcover. 1st Edition. Hardback in good condition with a good dust jacket. ex-library. Bell, 1974. Book. Very Good. Hardcover. Hardback in very good condition with a very good plus dust jacket in a protective mylar sleeve. Modern Chess: A New Guide to the Game of Chess as Played by the Modern Chess Master. 3rd ed. David McKay Co., 1935. Hardback in good to very good minus condition. 3rd revised edition.. 3rd Edition. Hardcover. Good. By Euwe, M.; Reinfeld, F.
Harcourt, Brace and Company, 1939. Hardback in good plus condition. No dust jacket. Name plate on inside of front cover. 1st American edition.. 1st Edition. Hardcover. Good. Beograd, 1981. Trade paperback in good condition. Volume 2. C 1. e4 e6 & 1. e4 e5. Soft cover. Good. Batsford, 1974. Hardback in very good minus condition with good minus dust jacket. Some yellowing.. Hardcover. Very Good/Good. New York, New York, U.S.A.: Harmony Books, 1981. Hardback in poor condition with fair dust jacket, protected in clear mylar jacket sleeve. Book and jacket have water damage but all is still readable and usable.. 1st Edition. Hardcover. Poor/Fair. 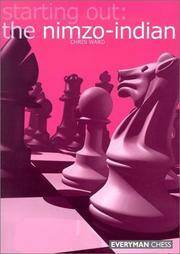 United Kingdom: Everyman Chess, 2002. Trade paperback in near fine condition.. Soft cover. Near Fine. David McKay Company, 1973. Trade paperback in very good condition.. Soft cover. Very Good. G. Bell & Sons, Ltd., 1960. Hardback in very good condition. Spots on tope edge of pages.. Hardcover. Very Good. David McKay Company, 1946. Hardback in very good + condition. Name on inside of front cover.. Hardcover. Very Good. Sahovski Informator, 1984. Trade paperback in very good minus condition.. Soft cover. Very Good. Chess Enterprises, 1994. Trade paperback in very good + condition. Name written on title page.. Soft cover. Very Good. David McKay Company, Inc., 1973. Trade paperback in very good condition.. Soft cover. Very Good. Coraopolis, Pennsylvania, U.S.A.: Chess Enterprises, 1987. Trade paperback in near fine condition.. Soft cover. Near Fine. Mineola, New York, U.S.A.: Dover Pubns, 1965. Trade paperback in near fine condition.. Soft cover. Near Fine.